covered their thorough, constant efforts to achieve success until now. Additionally, we take a closer look into hot topics around the accessibility of cellphones. As students living in the 21st century, technology is constantly at the tips of our fingers. Debate occurs, however, in what setting and quantity using cellphones is appropriate. 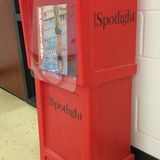 Spotlight is printed at least six times per school year for BV West students and the community. Its goals are to inform, entertain and interpret through bylined articles, opinions and editorials, while providing an open forum of communication for the diverse student population. Spotlight aims to be fair, accurate and impartial. The content of the print publication, online news site and social media accounts is determined by its student editors as determined by the Kansas Scholastic Press Act and may contain controversial subject matter as the staff exercises their First Amendment rights. 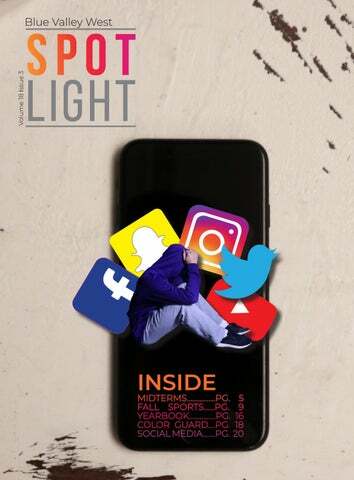 Spotlight does not necessarily reflect the opinions of the faculty adviser, the administration of BV West or USD 229.
ocial media is ever-present in the lives of high school students. Almost all students have a mobile phone, allowing them to access social media throughout the school day. To some, it is a necessity to their day whether they realize it or not. Reporter Kiley Peterson decided to go a week without Twitter, Instagram, and Snapchat, deleting the apps completely from her phone. Read about her experience and what she learned on page 20. One of the most prominent sustainability installations at JCCC is their aquaponics garden, a type of garden that raises fish and vegetables together. By using the same water, the garden significantly reduces waste, rather than doubling the waste by growing the two individually. The number and variety of field trips makes AP Environmental Science different than other AP classes, but the atmosphere of the class is one not found in many other AP classes. “The content is similar to other AP science courses,” Balquist said. “The class atmosphere is more relaxed and welcoming than other subjects.” AP Environmental Science is not just a class for those who are only serious about environmental science, but for a variety of people with a wide range of interests. “I think any field of interest should have some background in environmental science even if you’re going into business,” Quillin said. “A lot of business decisions in the future are going to be somewhat molded by their environmental impact.” The idea behind the study of environmental science is to look at the world. According to Quillin, because Earth is not just biology or chemistry, AP Environmental must reflect the broad spectrum as well. “It ties in the concepts students learned in previous science classes and then applies those concepts to the environment,” Quillin said. AP Environmental Science is a unique addition to student curricular opportunities. As society becomes more environmentally conscious, students will be equipped to excel. stand the significance of this election cycle. Gordon ‘s incentives to vote stem from the current political climate, her sense of moral duty and a simple longing for an increased knowledge of political issues. “Congressmen are the ones who make the main legislative decisions, so their decisions directly impact me,” Gordon said. “We are [also] given a great opportunity that other countries do not get. I feel like it is my civic duty to vote. People literally lost their lives for this freedom so the least I could do is register to vote, inform myself, and vote.” Like Macdonnell, Gordon regards the midterms to be as vital as the presidential elections. Unlike a nation-wide congressional elections taking place, the outcome of the governor’s race and other local races may affect the State of Kansas significantly. The midterms will have a greater impact on her life and therefore must be considered important. about her decision to vote. Nov. 6 will also be Price’s first time voting. The value of voting has [already] been instilled in her by her older siblings. In addition, Price also believes that living in a country that allows voting is a privilege. This privilege along with set precedents set by her family, influence her firm decision to vote. Moreover, the current political situation in America further encourages her to exercise her right. Price recognizes the apathy surrounding midterms, just as Gordon and Macdonnell do, but is not influenced by it. “The composition of the Senate and House play a crucial role in what gets passed, so putting your preferred official in office during the Midterms can create a huge wave of change.” said Price. This wave of change, she senses, will even travel to Kansas and into Overland Park, producing profound effects on local issues. “As a young person living in an affluent area, I know I am spared from many of the harsh effects that occur as a result of some policy change,” Price said. “However, I am very aware of many marginalized communities that very much feel the effects, such as Flint, Michigan and indigenous communities in Alaska who first-hand see climate change destroying their way of life. Even more personally, as a female, I am intimately affected by changes in access to reproductive health.” No matter the location or geography, religion or race, social or political views, voting affects each American. The outcome of these midterm elections will impact the average person’s life. Macdonnell, Gordon, and Price are all actively fighting to create the changes they want to see in their country. “You have the privilege of being given a vote, so go use it.” said Price. ith even a quick glance into the office of counselor Tara Lebar, a taupe colored cabinet cluttered with college magnets catches the eye. “I started this collection throughout the years [so] everytime I go on a campus visit, I try to buy a magnet,” Lebar said. “This way I can get those schools in front of my students’ eyes, but also, it’s a way to show where I’ve ended up visiting and encourage students to do the same.” As one-third of their job description, counselors spend a considerable amount of time setting up college readiness curriculum through advisory, writing counselor recommendations, meeting with students to talk about college and more. Among these many jobs, counselor Tara Lebar also finds time to visit a few college campuses each year. “I try to go and visit two to three colleges each school year,” Lebar said. “I think the best way to get the feel for a college and to learn about a college is by being on campus.” Lebar most recently visited the University of Utah and Westminster College prior to attending a national convention for counselors. The colleges Lebar visits often sponsor her campus tours as the counseling staff does not have a budget designated for campus visits. One aspect Lebar feels makes each school she visits special is their unique atmospheres. “When I get on campus, there’s always something so cool happening on every college campus,” Lebar said. “It may or may not fit you, but it fits somebody, and that’s what is so exciting about it.” Through these visits, Lebar hopes to become more knowledgeable on what different types of campuses have to offer. Lebar encourages students to visit college campuses early on in their high school careers. future often seem centered around a 4 year college path, the counselors are dedicated to informing student of other, less traditional options. “I’ve been working with Mrs. Garcia and Mrs. Dark on the advisory curriculum and a lot of the individual plan of study and career and college learning is happening through the advisory curriculum,” Lebar said. “Sometimes I think we think it’s four year school or it’s bad. We’re trying to take the judgement and labels off and just talking about different pathways.” Counselors also plan on utilizing the “BVW Counseling” page on Canvas this year. An array of college centered videos posted under “Modules” serve as a useful reminder for students with college questions. No matter a student’s final destination, the college assistance counselors provide them with leaves a lasting impact. Setting the tone for the year, fall sports show pride, grit, family and excellence. Win or lose, fellow Jaguars supported athletes and teams. The varsity team ended their season with a 20-24 playoff loss to the Olathe South Eagles. The team had three wins and 5 regular season losses under former Blue Valley Tiger Josh Koerkenmeier. Wins came against BV Southwest, BV Northwest and St. James Academy. Coming off of a State championship in 2017, the soccer boys had a big responsibility to Coach Aiman. Varsityâ&#x20AC;&#x2122;s record of 7-8-1, put them 3-4-1 in the East Kansas League. The leading scorer was senior Mason McGill with eight goals in the season, and Jo Koga offered the most assists with nine. Coach Horstick, now in her fourth year pushed the team through a losing regular season to a SubJV 35-2-1 State Championship and Sophomore 24-9-2 return to the State tournament. The team lost to Freshmen A 17-12 an improved team from Blue Valley High in the Freshmen B 22-9 quarter-finals. A golf star emerged in freshman Julia Misemer. The underclassman shot her way to championships at State, Regionals and the East Kansas League. The team placed fourth at State with the help of seniors Eunha Kim, Maddie Peterson, and Katharine Marcus, junior Molly Foster and sophomore Lauren Hartman. With five seniors: Olivia Hendrickson Sydney Holsinger, Maria Masroura, Olivia Oddo and Andrea Wolff and all graduating, it helped that the younger players displayed talent and leadership. The left-handed doubles team of junior Olivia Kurzban and sophomore Gwyn Gifford were runners-up at Regionals and State. The 29-member team enjoyed a close atmosphere evident by team cheers and tail-gate parties. Coach Mallory Huseman began teaching grit and building a cross country family with the teamâ&#x20AC;&#x2122;s Colorado training trip. The perseverance paid with a Regional championship and State Runner-up finish for the girls team. Seniors Kalea Chu and Lauren Dewitt placed in the top 10 at State. Seven other girls and two boys qualified to the State meet. her coach. “What she accomplished this year was pretty remarkable,” Anderson said. “She won every tournament she played, which is an extremely difficult task.” Misemer and the rest of the girls golf team will continue to impress as they prepare for future seasons. : How did you get better at your position this summer and gain exposure to college recruiters? : I attend Rubio Long Snapping Camp every summer and one every winter. Also when I am invited to college camps go to those. : What colleges teams are you looking to join next year? espite his busy schedule as a varsity football player and JAG mentor, senior Caden Bolz sat down to answer a few questions. He discussed how he became a sought after college recruit as his position, long snapper, and the influence of the football team on his life and character. : Why do you love the sport of football so much? : What is your favorite moment as a Jaguar? : My favorite moment at West is a recent one. Getting redemption on Southwest this year was one of the best feelings I have ever had. Beating our “rival” by 47 is something I will never forget. : The thing that I love about football is the camaraderie that I have with my teammates. I treat my teammates like members of my family, they are my brothers and I would do anything for them. : How did you get into long snapping? : How has the BV West team impacted you as a player? : Being a Jaguar has impacted me personally because I have really learned how to improve from losses. I understand no matter how hard you get knocked down, that you have to fight to be back up. : How does it affect you to know that many of the younger kids on the team look up to you? : Personally I love it, I love being seen as a role model. When I was younger I would always look up to the seniors and other varsity players and think about how cool they are. I want to help the freshman feel the same way, I want them to know how important to this program they are, and just because they’re freshmen doesn’t mean no one likes them. Like I said before this team is like a family and that includes everyone who is involved. Visit Zaxbyâ&#x20AC;&#x2122;s at 9500 W. 135th Street. Ready to help any school groups. Every Wednesday is Teacher Appreciation Day teachers get 10% off entire order. CHECKERS CLUB A s a newer group, checkers club has attracted a lot of attention, just as the chess club did last year. tudents of all grades gather once a month to discuss their common interest of philosophy. PING-PONG CLUB ll students are welcome to participate in a series of ping-pong games. YOGA CLUB oga club offers a break in the day from the stresses of school. ne world, one team, one family, that is the theme of this year’s show for Competitive Marching Band. The team, consisting of the marching band and the color guard, performs at competitions across Kansas and the Midwest. Color guard is known for their bold costumes and fierce performances, but this season, they are taking their show to a new level. Iridescent flags and eye-catching choreography added new visual elements to the show. Directors Roman Garcia and Kate Anthony returned to instruct the group. Anthony, the team director, has been working with the group for six years. Her job includes writing practice drills and directing choreography. It also involves movement and equipment, scheduling and all of the behind the scenes set-up. “I’ve taught color guard [since] forever,” Anthony said. “It’s always been a creative outlet for me.” When Anthony was in high school, she was a part of the Husker Band and a member of the winter guard at Lafayette County C-1 High School in Missouri. She knew that she liked both winter and color guard and always had the thought of joining in the back of her mind. She joined the color guard team her sophomore year of college and never looked back. Now she is directing her own color guard team. The color guard was instrumental in the competitive band’s win at the Kansas Bandmasters Association State Championships with their unique choreography and flag routines on Oct. 20 in Topeka, Kan. The last competition of the season was in St. Louis, Mo. on Oct. 27. Of the 74 bands, 14 performed in Finals. Although, they did not qualify, the band and color guard took another step toward competitive marching band excellence. napchat. Instagram. Twitter. YouTube. These well known platforms are among the many social media applications that teens use on a daily basis. The average high school student spends a large portion of their time sending Snapchats to their friends, posting, commenting, or liking pictures on Instagram and watching the latest Youtube videos of their favorite Youtubers. Teens use social media daily, to maintain communication with friends. Some are bored and have nothing to do, or simply because they want to see what others are doing. I went an entire week without using any social media to see what my life would be like without it. Studies by the Council of Pediatrics show that after giving up social media, people should be more happy, productive and innovative. I wanted to see if this was true. Before my week long break, I felt giving up social media would be easy. I figured it would be a nice break from my phone. My initial thought was that I would be able to do it “no problem” because I did it willingly. Being “app free” was my choice and I was excited to see what would happen. I went to a football game on Friday and then to a haunted house on Saturday. I lost tack of how many times I wanted to go onto Snapchat or Instagram and post about my night. The most difficult was when I wanted to Snapchat friends while in the car ride to the haunted house. How many hours a day do you use social media? People don’t realize how much time they spend on social media platforms and how much they let it control their lives. By giving up social media, I learned that I was more productive with my time. Even though I felt like I was missing out, I realized Snapchat, Instagram, Youtube and Twitter are not the most important things in the world. My life does not revolve around them. I recommend that everyone give up social media for at least three days because it really helps you see how much time you spend on it and how much you rely on it. This experience has motivated me to give up social media for at least three days to a week every month so I can concentrate on what matters. interest in until I had no social media. Now, I work on my bullet journal every day. I’m glad that I started it up again. I’m not going to lie, giving up social media was difficult but it was worth it. It gave me a chance to focus on school work and reconnect with old hobbies and find new ones. e’ve all heard it. The buzz of the phone, the sheer panic to hit the silence button, and the intense stare of the teacher followed by the directive “put your phone up.” Phones in the classroom create mixed feelings for students, staff and administration. Phones are powerful objects in our everyday lives. When used correctly, they keep students safe in potentially dangerous situations as well as make for great learning tools. When used poorly, they result in bad decisions, distractions, cyberbullying and safety hazards. Phones in school environments have their pros and cons. The main issues are distractions that result from inappropriate phone use. Since phones have become an issue in some classrooms, several teachers have implemented “pockets” for student’s to put their phones in at the beginning of class. Other rooms allow phones out on the desk to be used at leisure. Which system is the best? objectives. Students sometimes feel like having their phone with them is not only a stress reliever, but necessary for safety reasons. Let’s face it, taking a brain break in an 87-minute lecture relieves stress. Writing notes, or checking the calender in their phones can be completely legitimate when a teacher gives a big homework assignment. Most importantly, if the school is preparing us for “active shooters,” my first line of defense is to have my phone. Having your phone during an emergency or knowing you can is a comfort. Shouldn’t high school students be wise enough to know when to put their phones down or be prepared to handle the consequences? Or do we still have to rely on others to tell us when and why it is time to prioritize learning. Students should know how to handle and use our technology and should be allowed the simple freedom to chose to use it for our own benefit. If we make a mistake we’ll learn from it and grow. BV West family is more than a hashtag. If youâ&#x20AC;&#x2122;re worried about yourself or a friend, talk to a counselor, teacher, administrator or coach. 1. Make the cookies: Whisk together the flour, cream of tartar, baking soda, ground cinnamon and salt. Use an electric mixer to cream the butter and both sugars for 1-2 minutes. Mix in the egg, egg yolk, and vanilla extract. Stop to scrape down the bowl as needed. Add dry ingredients to the wet ingredients and mix until combined. 2. Cover tightly and refrigerate for at least 30 minutes. 3. Preheat oven to 350°F. Line the baking trays with parchment paper 4. Make 1 tablespoon balls of cookie dough 5. Coat the cookies: Whisk together the 1/4 cup of sugar and 2 teaspoon cinnamon for the coating. Coat each ball of cookie dough in the coating mixture and place on the baking trays 6. Bake at 350°F for 7-10 minutes or until the tops of the cookies are set. Allow cookies to cool on the baking tray for 5-10 minutes. of what a Cheez-it is, and can ever hope to be. Itâ&#x20AC;&#x2122;s the gold standard of the entire brand. Praise be to the original. residue that always lingers on your fingers after indulging in a handful of these wonderfully flavored delights. hour, or they simply found out that the aired out flavor quickly became the best part of the Cheez-it experience. Nonetheless, no mistake was made here in the great creation. nothing short of almost perfection. If they’d just pump it up a little bit, there could be nothing better in the cracker universe. combo worthy of World Food Prize. Really though, what is it? The original? Parmesan? White Cheddar? It. Doesn’t. Matter. Just eat it on the couch while watching The Office and move on with life. Bouncing into fall, children bounce into the sky on an in-ground Jumbo Jumper. Whatever floats your goat. Three excited visitors feed and get acquainted with a goat at the Cider Mill’s petting zoo. Hitting the hay, groups of visitors take hayride tours of Louisburg Cider Mill’s 80-acre farm. Great fall light shines on juniors, Anushka Ganesh and Lauren Kish greet fall and pose for a picture in front of the 10-acre corn maze. In they go, a fork lifts dumps a box Cider Mill grown apples into a water wash so they can be sold as any number of the products in the shop at Louisburg Cider Mill. The barn. The Cider Mill’s classic barn is a landmark in Louisburg, Kan. It is also where customers buy warm donuts and Lost Trail rootbeer. Come “ear” often? Children and adults alike play in a crib of corn near the entrance to the Ciderfest. Hold on, a group of teens cling to the chains of a tire swing as they dangerously catch air. FAMOUS MOVIE QUOTES Come to Room 233 for a prize. You’re amazing, Jags! You keep making	the year and we’ll keep taking pictures.